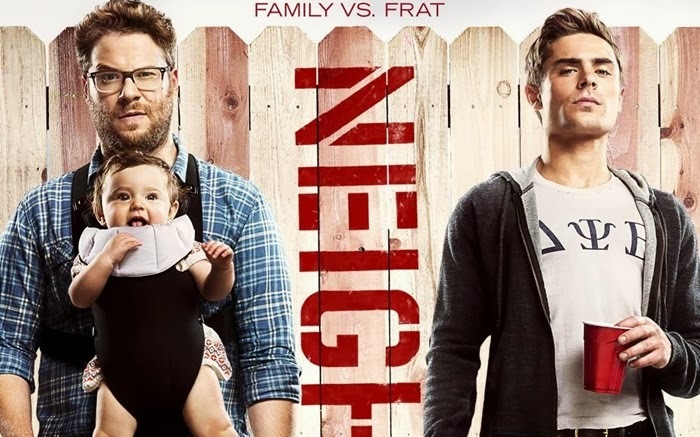 Neighbors is a 2014 comedy starring Seth Rogan and Zac Effron. It’s directed by Nicholas Stoller, the director of Forgetting Sarah Marshall and Get Him to the Greek. The film is about a young couple that gets into a rivalry with the frat house next door. Mac and Kelly Radner (Seth Rogan and Rose Byrne) have just bought their first house and have settled in with their infant daughter. They are trying to adapt to their new family lifestyle and seem to be adjusting nicely until the Delta Psi Beta fraternity moves in next door. The Radners introduce themselves to Teddy and Pete (Zac Effron and Dave Franco), the leaders of the frat. The Radners hesitantly ask if they could keep the noise down at night so their baby could sleep and Teddy agrees but asks that Radners call him personally if they are too loud and not to call the cops. A few nights later the frat is being loud and the Radners try calling Teddy, but Teddy won’t answer and the Radners end up calling the cops. The cops show up, the frat finds out it was them that called the cops, and they declare war on the Radners. The rest of the film is a classic escalating prank war as both sides try to outwit each other. Delta Psi Beta starts to torment the Radners as the Radners try to find a way to get the fraternity kicked out of school by exploiting the university’s three strikes policy. Sometimes the frat is winning, sometimes the Radners are winning. Both sides fight amongst themselves as the stakes and tension rise. There are a lot of funny gags and great lines, and the movie is elevated because the cast is so likeable. Rogan and Byrne make for a great couple, and Zac Effron and Dave Franco are hilarious as well. Oh, and Christopher Mintz-Plasse is in it too. Any movie is automatically better if McLovin is in it. It’s a good movie, maybe not destined to be a classic, but it’s worth watching and you might catch yourself quoting it quite a bit.